This stunning, 125m², two bedroom apartment in Barcelona, is located in Poble Sec, the ideal choice for your trip to the Catalan capital. It was renovated in late 2013 and has the most modern finishes. This lovely neighborhood offers a quieter experience than to be found in the city centre. Near the apartment you will find everything you need including supermarkets, bars, cafés, banks and pharmacies. It is also located next to Carrer Blai, considered La Rambla of Poble Sec. The area is situated at the base of Montjuïc Hill and allows visitors easy access to both the historical sights as well as Barcelona’s beaches. This apartment sleeps up to ten people and has two floors. On the main floor you will find a fully equipped kitchen, dining and living room and a double room with an en-suite bathroom. In the living room large windows overlook a typical Barcelona street. This apartment is easily accessible for people with reduced mobility. The other living area on the top floor is equipped with sofas and armchairs perfect for relaxing. Four single beds and two double sofa beds can also be found throughout the apartment. This apartment is located less than 250 meters from two metro stations, and only 10 minute walk from the port of Barcelona and the popular Las Ramblas. The living area maintains a sleek, modern design throughout and also features a TV. The kitchen is spacious and is well-equipped, ideal for whipping up some delicious home cooked meals. 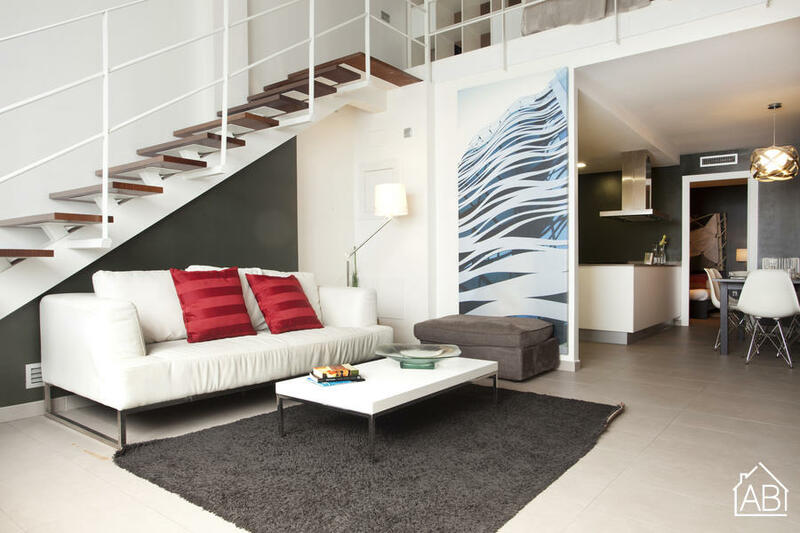 Complete with Wi-Fi, heating and air conditioning, this lovely apartment provides the perfect base for your trip to Barcelona any time of the year!